Hand raising lambs is a joyous and time-consuming experience - akin to looking after children! It is very important to remember that you are responsible for all aspects of the animal's life from health and nutrition to learning normal behaviours, and it is a commitment which should not be undertaken lightly. Following intake of colostrum, lambs should be raised on a commercial milk supplement. There are many good quality milk powders available which are specifically formulated to meet the lambs' nutritional requirements. Cows' milk alone is not a suitable substitute for lambs as the total solids, fat and protein content are too low. It should only ever be offered in an emergency situation and use full cream powdered milk only. Mix 200g of powder with warm water to make up 1 litre of milk. Actual cows' milk should never be diluted with water either. A rough guide to feeding is to administer about 10% of the lamb's body weight per day in milk. The temperature of the milk does not matter (usually cold is best), but if the lamb is hypothermic then the milk should be warm. Also provide ad lib water. From 1 week of age lucerne hay and sheep pellets should be made available. The minimun age to then wean onto concentrates is 4 weeks old. The minimum age to wean onto good quality pasture alone is 6 weeks (8 weeks better). Lambs that have been artificially reared can be reintroduced to the mob once they have been weaned onto good qualilty hard feed (pasture, hay, pellets). This is usually at 6-12 weeks of age. Lambs should be marked (i.e. vaccinated, tail docked, ear tagged, ear marked, +/- castrated) before reintroducing to the weaner mob. Lamb marking is generally performed around 4-6 weeks of age. Frequent contact between the reared lamb and the mob prior to reintroduction can make the transition easier. This can be achieved by walking the lamb around the boundary fence and having animals penned alongside one another. Sheep can make excellent companions and in some circumstances you may decide to keep your lamb and rear it as a pet. However, entire male sheep do not make suitable pets and may even present a danger to children and adults. If you decide to keep a ram lamb pet it should be castrated before 6 weeks of age (both for safety reasons and before sexually maturity is reached). Identification: All sheep in Western Australia must be branded and ear marked, and owners issued with a Property Identification Code (PIC). Please seek further advice on how to apply for registration from the WA Agricultural Department. Ear marking should be performed at weaning. 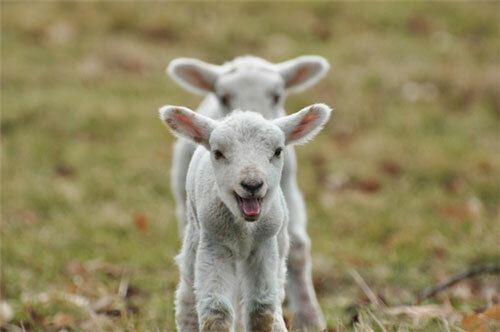 Vaccination: Lambs should be vaccinated against Clostridial diseases and caseous lymphadenitis (CLA). These pathogens are readily encountered in the environment thus making vaccination the best form of prevention. Vaccination is usually performed at marking and then repeated in 4 weeks time at weaning. An annual vaccination is then required to maintain lifetime immunity. Parasite control: Control of internal parasites is achieved through oral drenching. In single sheep households drenching is usually required infrequently. The best method to determine whether drenching is required is to monitor the faeces and request a faecal worm egg count (WEC) at your veterinary hospital. Sheep can also get external parasites such as lice. Monitor the sheep for any signs of wool loss or itchiness. If this occurs seek advice about the most appropriate chemical control method for your pet sheep. Nutrition: Pasture or good quality hay supplemented with grain is the best form of nutrition. Avoid garden plants and weeds that may be toxic. Also seek advice about any nutritional supplements (selenium, cobalt, vitamin E etc.) that may be recommended in your area. Ensure water is available at all times. Shelter: Provide protection against rain and sun, and also stray dogs. Hoof trimming: Perform regularly. If you are unsure how to trim your sheep's hooves we can do this for you at the Mt Barker Veterinary Hospital. Shearing and crutching: Generally sheep need shearing once yearly unless you have a shedding breed (Damara, Wiltshire, Dorper). Shearing is a good time to inspect the wool for any parasites. Crutching is also generally required yearly and helps to avoid issues with dags and flystrike. Sexual maturity: Puberty in sheep varies between breeds and is also influenced by nutrition. Ewes generally reach sexual maturity at 7-9 months of age and will cycle in late summer-autumn. Rams generally reach sexual maturity between 23-27 kg bodyweight and thus are castrated early in life. Homosexual behaviour in male sheep is normal.